The SkyEcho ATT-20B has been approved for use in the United Kingdom under the Civil Aviation Publication (CAP) 1391 Electronic Conspicuity program. What does this mean? You can increase your safety in the air and enjoy the benefits of ADS-B for a fraction of the cost of installing it in your aircraft. See our FAQ for more information. Weighing just 50 grams SkyEcho broadcasts your aircraft type, position, altitude, course and speed to surrounding aircraft in real-time, while the integrated ADS-B receiver allows you receive and display traffic information from surrounding aircraft using an EFB (Electronic Flight Bag) such as Skydemon or a GDL90 compatible EFIS display via Wi-Fi. An integrated WAAS GPS provides position data to the ADS-B transmitter and correlates your position with received traffic for viewing on supported displays. 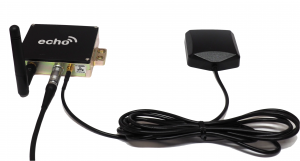 SkyEcho is a complete portable ADS-B in/out solution. 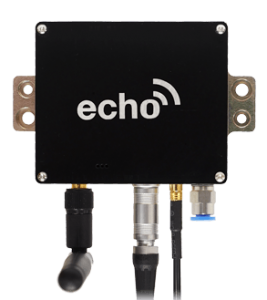 The palm-sized Echo allows you to transmit your aircraft type, position, course and speed while simultaneously receiving surrounding traffic information. Connect wirelessly to SkyEcho and receive live traffic on your GDL90 compatible EFB or EFIS. Electronic Conspicuity (EC) is an umbrella term for a range of technologies that, in their most basic form, transmit the position of the host aircraft to other airspace users operating compatible equipment. More advanced devices can also transmit and receive, displaying and alerting pilots to other/conflicting traffic who have compatible EC devices. EC devices turn the traditional ‘see and avoid’ concept into ‘see, BE SEEN, and avoid’. You can learn more about the program on the UK CAA’s Electronic Conspicuity page. An EC device cannot be used at the same time as a transponder and it doesn’t replace the need for a transponder when required by airspace/flight rules. If your aircraft is fitted with a working transponder, you must switch off the transmitter function of your EC device. SkyEcho provides this functionality. Is it only approved in the United Kingdom? For now, yes. But many other European countries are exploring the concept, and it is possible that EASA may adopt the concept under a harmonized standard. EC devices are not approved for use in the U.S.A. The SkyEcho (ATT-20B) is a portable device that you can take with you from aircraft to aircraft and does not require physical or electrical installation into the airframe. EC devices use a 24-bit address in the same way as a transponder. This usually forms part of an aircraft’s Certificate of Registration. However, as an EC device is designed to be portable and to also be used by unregistered aircraft, the 24-bit address will be programmable by the user. The device is small enough to sit on your glare shield and fit easily in your flight bag; you only need to supply power through a battery pack or directly from your aircraft. Refer to the guidelines under the section titled “How to use 24-bit addresses with Electronic Conspicuity Devices” section available on the Electronic Conspicuity page. What kind of range does it have? The SkyEcho is both an ADS-B IN (receive) and ADS-B OUT (transmit) device. Range is a function of transmit power. The SkyEcho has a 20 watt transmit power, which will allow you to BE SEEN by other aircraft and ATC for up to 70km (~40 NM) away. Depending on the output power of other aircraft, you will be able to SEE other aircraft over 270km (~150 NM) away! What frequency does it use? The ADS-B standard frequency for most of the world (all but the U.S.) is 1090Mhz. In the U.S. 1090Mhz as well as 978Mhz is used. SkyEcho transmits and receives on 1090Mhz. Can I see other aircraft with SkyEcho ATT-20B? Yes! SkyEcho has built-in Wi-Fi hotspot that allows you to connect and display nearby traffic on a compatible app. SkyEcho uses a common interface format called GDL 90. As of now (Nov 2016), SkyDemon, Foreflight, Avare, Naviator, iFly 740 and FltPlan Go are a few of the compatible applications. If you are a developer and would like to confirm compatibility please contact us. Can other aircraft see me? Yes. Any aircraft equipped with ADS-B IN capability can see you. This includes other EC devices as well as installed avionics, and other third party systems such as the Garmin GDL39, PilotAware and Flarm. Yes ATC can see you if you are transmitting within range of an ATC ADS-B ground station radio. EC systems are designed for aircraft to aircraft visibility. An EC device will not meet standards to allow you to enter controlled airspace. Additionally, if you have an installed Mode S transponder in your aircraft, you will have to turn off the transmit function of the SkyEcho. This is standard for all EC devices and is designed to keep you from presenting a “double target” on ATC displays. The SkyEcho configuration app allows you to turn off the transmit function while still being able to receive traffic for display on the compatible app. Does it have an app? How do I view nearby air traffic in my cockpit? 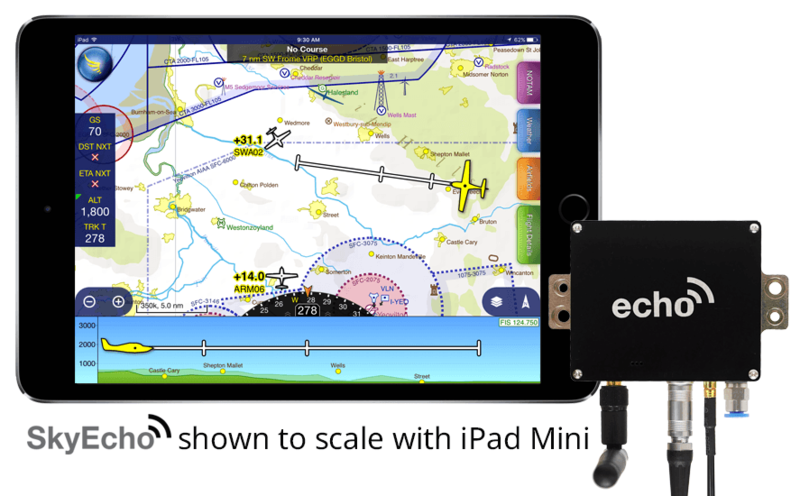 The echo iOS app is a configuration app that allows you to configure device settings, including setting the ICAO address and enabling/disabling the transmit function. The echo iOS app is not a moving map or traffic display app. For this functionality, you will need to pair with a compatible application such as SkyDemon or your preferred EFB. Do I have to reconfigure it if I move to a different aircraft? How? If you are moving from one aircraft to another of similar size and type, you should not have to change anything. However other configuration fields exist for type of aircraft (light, glider, rotorcraft, etc.) as well as aircraft size, etc. EC devices are intended for voluntary carriage on registered and non-registered UK Annex II aircraft, non-complex EASA aircraft of <5700kg MTOM and for gliders and balloons (including those covered under ELA 1 and ELA 2). Can I mount it permanently in the aircraft? SkyEcho is small enough to fit unobtrusively on the glare shield but some users may prefer a permanent installation. The rugged aluminum chassis provides long-term durability and features mounting tabs for installation and use with an external antenna if desired. What is in the box? Do I need anything else? You will need to supply your own battery pack (and charger) or direct wiring into auxiliary power in your aircraft. We currently recommend the following battery and charger for ease of use. We recommend a 12V source for auxiliary power. 28V systems are not recommended for this device. We hope worldwide! Regulatory agencies are viewing EC devices as an affordable solution to increase the safety of national airspace systems by providing pilots with greater situational awareness. The UK is the first, EASA soon to follow – from there – who knows? As far as the product goes, we will plan our roadmap based on feedback from our customers and hope to deliver a more integrated product in the future.